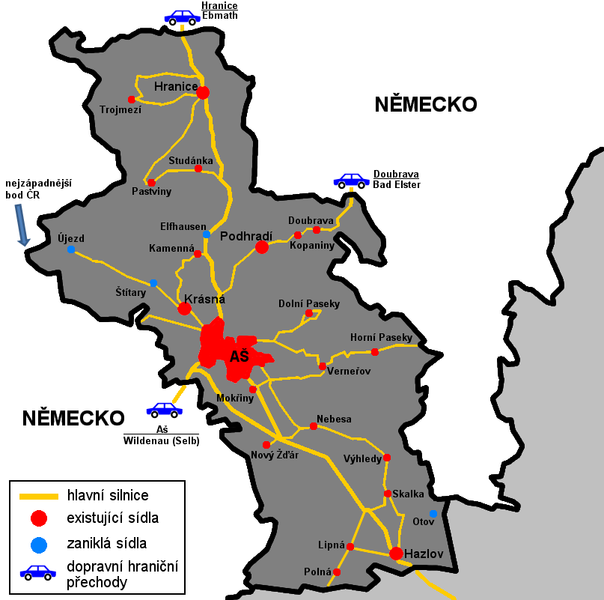 Recently I wrote about the history of the Czech border region. Now it's time for a geography lesson. Specifically, I want to draw attention to the hook-shaped areas of land that thrust out into Poland and Germany along the Czech Republic's northern frontier. They're called výbežky (projections) in Czech, and there are five of them. I find them fascinating. On the map below I've numbered these "hooks" in order of appearance on my cycling circumnavigation of the Czech Republic. I'll be riding around all of them despite the considerable extra distance they add to the route. I want to discover how they differ from more central parts of the country. I'm especially interested in the Hook of Aš (pronounced "ash"), which juts out into Germany - like a promontory into the sea - at the point where Bavaria rubs up against Saxony. It's 19 km long and just 5 km wide at its base. As with the other hooks listed above, Czechs made up a tiny minority of its population before 1945 (just 1.2% according the 1930 census). To the majority German population it was known as Asch. This was the first area of Czechoslovakia to be liberated by U.S. troops at the end of World War II. Soon afterwards, the German population was expelled and Czech settlers moved in. But then the Iron Curtain came down and Aš ended up as piggy in the middle. Hemmed in by West Germany on one side and East Germany on the other, it was almost cut off from the rest of Czechoslovakia. Movement in the area was tightly controlled by the communist authorities. For me, the Aš Hook will mark the end of stage 3 of my journey and the start of stage 4. It is there that I will join the Iron Curtain cycle route and head south into the Bohemian Forest. But first I intend to explore this far-flung area of the country and try to get a feel for what it must have been like to live in such an isolated part of the world during the Cold War.